While Karma did watch the bugs and look like he was thinking about going after them a couple times, he ended up not eating any of them. No worries! I'll keep syringe feeding him for as long as he needs it, and will continue putting a couple insects in his enclosure every day just in case. I think his eyes were bothering him a little today, as he kept rubbing his face on things and there seemed to be some old shed stuck in his right eye. He managed to flush most of it out during his shower, so hopefully he'll be more keen on eating soon! Now that Karma can actually see me, he's gotten a lot more wary. He definitely tries to get out of my way and/or hidewhen I need to take him out, but he seems to relax once he's out of his enclosure. I've been trying to keep things as calm and predictable as I can, and am trying to do things in the same order at similar times. I'm honestly not sure how good chameleons are at recognizing routines, but he seems to be settling down a bit either way! I also had my feeder cups come in from Full Throttle Feeders today, and they're brilliant! The crickets were quick to start scaling the grid, and Karma was watching them very closely from his basking perch. Thanks @nick barta! Part of the reason he didn't eat anything today may have been due to the size of the crickets... they've grown a lot since I first picked them up! I took all of the questionably sized ones and fed them to my starling, who was more than happy to oblige. Nothing will go to waste, that's for sure! I'll pick up some additional smaller ones this weekend. Im glad he's improving each day! I bet he will be eating on his own soon. I'm so glad you brought him home, I think you're doing an amazing job with him! Also, I ordered a full throttle feeder yesterday! Your two cups landed in San Francisco tonight, and are scheduled for delivery by 8:00pm tomorrow (Friday). You will like these cups! Yay! Thank you! I'm so excited! Karma was unimpressed with my shenanigans this morning, haha! Couldn't resist snapping a picture of his half hearted puff when I started reaching for him to give him his drops and food. Sorry it's a little blurry, my lens needs cleaning! That's definitely his favorite basking spot - he goes there every morning after misting. His feeder cup has been strategically placed within easy reach, so I'm hoping he'll eat something on his own soon-ish. *fingers crossed* He gets feistier every day! His left eye looks almost completely recovered now and is no longer sunken, and his right eye is on it's way to recovery. Oh yes! You're starting to get the JudgyMcgrump looks from him! That's a great pic! I didn't think it was blurry at all. Thank you! He's turning into a real character. I love it! Karma JudgyMcgrump... it seems very fitting! Karma is (maybe?!) eating! I left five crickets in his cup today and didn't syringe feed him this morning, and when I got home only one escapee was remaining! I reckon it was the one that hopped out of the cup in the morning (and subsequently I couldn't find), as it crawled out of the woodworks while I was misting Karma before bed. I'll repeat the experiment again tomorrow with more bugs and see how it goes! I really don't think there was much of a chance that the crickets could have escaped, in any case. There're only so many places they could have gone, and my preferred location is in Karma's belly! He seemed considerably less stressed about me today, and didn't immediately head for the hills when I opened up his enclosure. At least, he didn't retreat until I started misting him. Then he acted like the water was acid and did some pretty impressive acrobatics to escape! So far he seems to prefer his water to be on the warm side, as opposed to room temperature. He settles down to drink and clean his eyes eventually, but it's a matter of seconds with warm water (after the initial shock) vs 2 or so minutes with room temperature water. Interesting! There was also some cautious interest when I held up his escaped cricket this evening, but I don't think he's quite ready for handfeeding yet. I'll get some higher value treats when I pick up more crickets - that ought to help win him over! I'm kind of surprised by how much personality this guy has, and by how much I'm enjoying the process of getting him set up! I definitely don't hate the idea of maybe having more chameleons in the future. Karma's definitely eating! I put his feeders in his cup and walked away, and when I next saw him he had his lower body mostly IN the cup and there were no crickets left! He also had some banana/mango/papaya mush smeared on his face and hind leg, so he may have sampled some of that as well. Yay! I'm now mostly out of feeders (Benjamina the starling really liked bsfl haha! ), so I'll stop by the store today and see what they have in stock. I spotted some tiny hornworms last time, so I'll pick up a couple of those as well. Awesome.... his progress is amazing! Your doing an awesome job! I'm so sorry if I missed this earlier in the thread, I couldn't find the answer. Were you syringe feeding carnivore care? I think I may be starting that tomorrow because Miss Stubborn has now decided she is extremely grumpy and LITERALLY holds her mouth closed. Lol yeah - it can be difficult to get that mouth open if they're not playing ball! I'm currently using Emeraid Intensive Care - Carnivore. I personally like it more than Oxbow Carnivore Care, partially because it seems to mix/draw up better, and partially because it smells less to me haha! And thank you! I'm really happy with Karma's progress so far, though he's being a stubborn little guy right now and has gone off food again. No worries - I'll starve him out for a day or two, and then resume syringe feedings if he still isn't interested. His right eye still needs some time, but his left is looking good. The pun may or may not be intended haha! I'll post a proper update on Friday, after I have his MistKing and live plants set up. My delivery should be arriving tomorrow (finally!) with his auto mister, a few MagNatural planters, some Repashy gutloads, a proper lighting system, and a couple other odds and ends. It took awhile since the clinic doesn't order from Northern Gecko very often, and I'm super excited! I'm really enjoying the excuse to get houseplants and put them everywhere! I just got a young schefflera and put it in Karma's enclosure yesterday, and have a wandering jew and two pothos (golden, pearl and jade) waiting for their magnetic planters. I'm also starting to eye up other plants for his big boy enclosure (my spring/summer project! ), as well as "free range" plants. There were some really gorgeous 4ft braided weeping figs that I was sorely tempted to buy! And some absolutely stunning bromeliads... I'll make myself a jungle of animal safe plants, haha! I'll just have to keep my parrot away from them. Monty killed my Japanese elm bonsai that I cultivated from seed to maturity, and I just sort of... stopped with plants after that. But I digress! I get so excitable about hobbies. That's so awesome!! Magnetic planters? I get excited too! 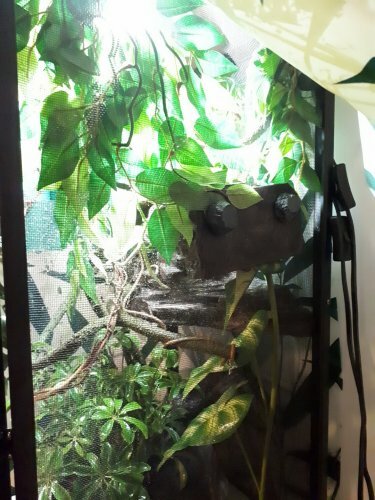 I just ordered a new lighting system from light your reptiles I'm eyeballing a dragon strand cage to upgrade since I had to get her cage together in a day! 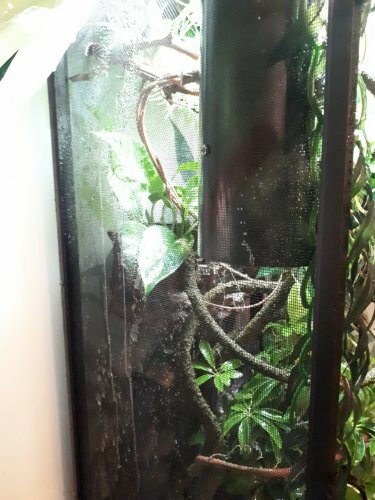 I'm curious to see how you like the mist king, I have the monsoon atm but I will probably upgrade We have a ficus, schefflera and snow white pothos, but the pothos isn't doing as well, I think it may not be getting enough water? I'm way better at animals than plants lol!! 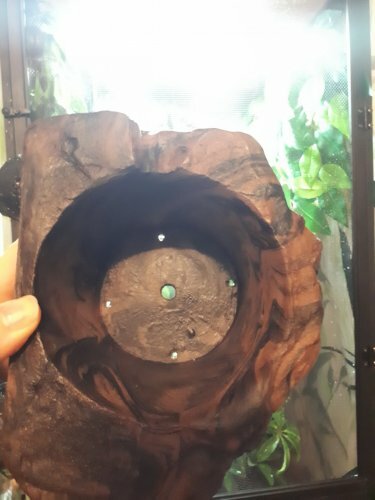 This company called MagNaturals makes these really nifty magnetic planters and accessories and I thought it'd be super handy, especially for someone like me who likes to spontaneously rearrange habitats! Due to my current space restrictions, I'll probably be getting a 36x18x36 exoterra (screen). I'd love to build my own cabinet one day when I have the room and resources! This has all been very sudden. With the plants, are you watering them thoroughly ~x2 a week or so? Your pothos may not be getting enough water to its roots from misting alone! From what I've been reading, that's a common reason for plants to fail in cham enclosures. I couldn't tell you much - I'm still in the midst of brushing off my green thumb (what little I have haha!). I'll be sure to post my adventures setting up the MistKing... I can be a bit of a trainwreck with electronics! LOL let me know if you need help with the mistking. Setting up mine was a bit of a learning curve. Biggest issue was getting it to prime the first time. I had to hold the button for about 4 minutes instead of the1-2 that they said. That's good to know! I definitely would have thought I was doing it wrong/had damaged the machine. Thanks! 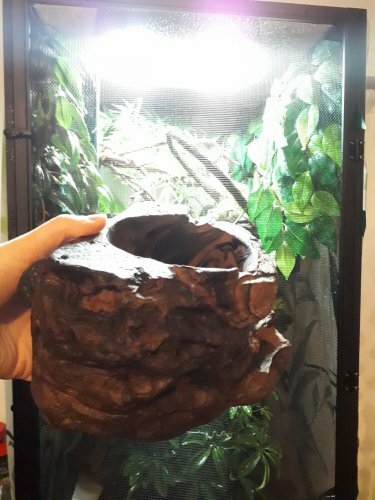 My stuff arrived yesterday, and I spent most of the evening rearranging Karma's enclosure to incorporate two of the three MagNatural planters and my new baby schefflera arboricola. The planters didnt have any drainage, so I drilled 5 holes in each of them: one big one in the middle, four smaller ones around the rim. Unfortunately, the lighting I had ordered (24" ReptiSun LED UVB) is much too large for his enclosure! I had ordered it when I thought I'd be purchasing a 24x24x48 cage, but since I'm going for the 36x18x36 instead... well, I guess I'll be returning it. I haven't touched the MistKing yet, but I'll get it up and running either later today (depending on how long my errands take) or on Sunday. And here are some pictures! As the plants grow out I'll progressively remove the fake ones. Forgive the lighting, I'll be upgrading that later today.